This week’s photo taken in 1947, is looking across to St. Paul’s Cathedral from just south of Queen Victoria Street. 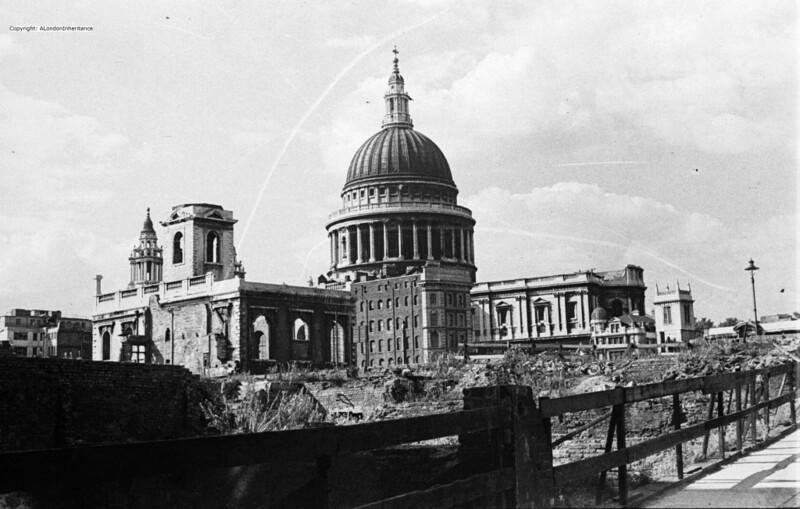 The photo clearly shows the devastation that wartime bombing caused to this area of the city and how amazing that despite this, St. Paul’s survived with relatively minimal damage. The areas that were bombed were quickly cleared of any standing structures to make these areas reasonably safe, with just rubble, foundations and cellars remaining. The exceptions to this were the churches of the city which, despite suffering terrible damage, were left standing ready for rebuilding. The church in the foreground is St. Nicholas, Cole Abbey on Queen Victoria Street. The rebuilt church still stands, however finding the exact location of the original photo is impossible due to the amount of rebuilding and loss of many of the smaller streets. I am not in the exact position, my father’s photo was taken further back towards Upper Thames Street, however I could not get to the point I wanted due to the building that is now across the site. The view across to St. Paul’s is also totally obscured by building with the exception of the very top of the dome. As with the majority of City churches, it has been a location for a church for many centuries as the original St. Nicholas, Cole Abbey was founded before 1144. 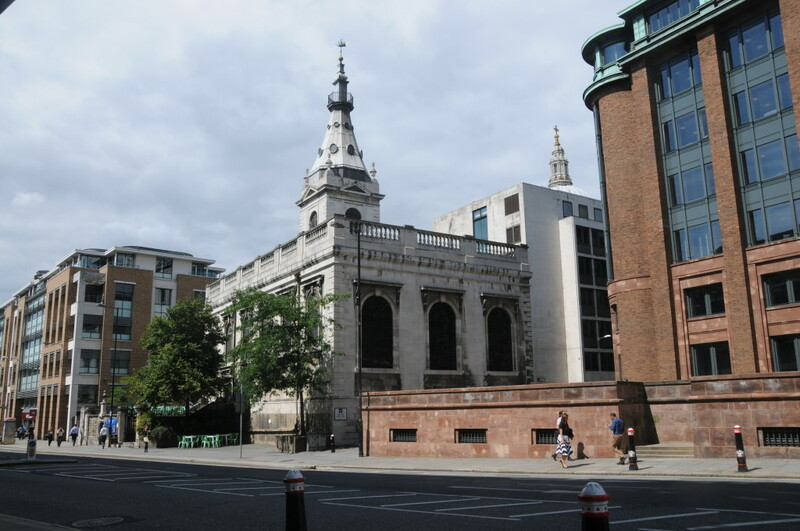 The church on the site was destroyed in the Great Fire and rebuilt by Wren as the first rebuilt after the Fire. The name of the church is somewhat misleading as it was never the site of an abbey. Some sources attribute the name to a derivation of coldharbour. Interesting to compare the 1930s drawing with the rebuilt church of today and admire how accurately the steeple on top of the tower has been rebuilt after complete destruction during the war. St. Nicholas, Cole Abbey has also featured in film. 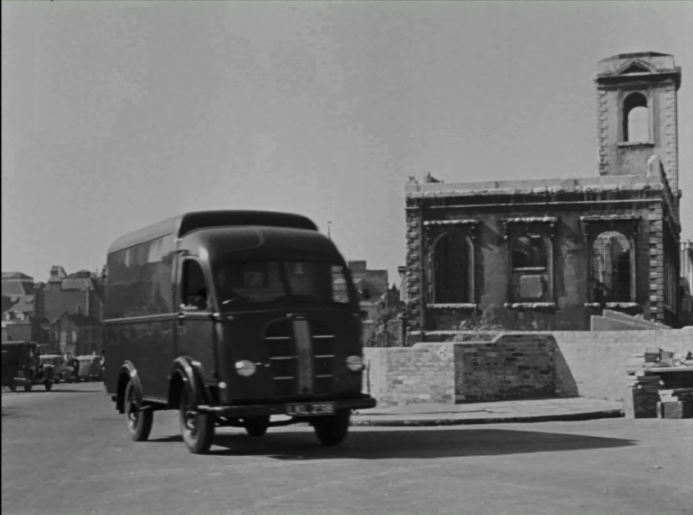 The excellent Lavender Hill Mob released in 1951 was filmed in a number of London locations, including the bombed landscape between St. Paul’s and the river. 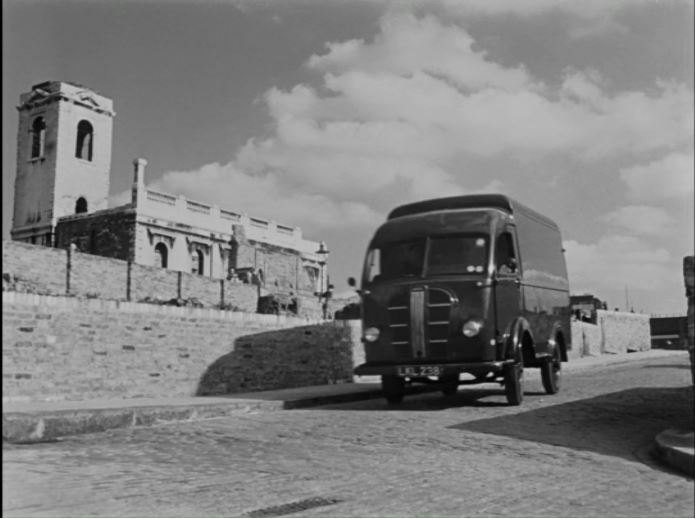 The theme of the film is a gold bullion robbery which takes place outside of St. Nicholas when the van carrying the gold is hijacked and driven to a warehouse on the edge of the river. This film is very well worth purchasing, not just for the story, the excellent Alec Guinness and Stanley Holloway along with a very early appearance by Audrey Hepburn, but also for the many scenes shot in the City just after the war and prior to the start of any rebuilding. The area is so different today, however fortunately as across the City, the Wren churches continue to provide landmarks to the earlier topography of the City. This entry was posted in London Churches, The Bombed City on August 24, 2014 by admin. Fascinating – St Paul’s actually looks more damaged than in some of the other post-bombing photo’s that were used in the newspapers at the time; or maybe it’s the effect of seeing all the surrounding damage? The Gerald Cobb picture is great, showing the intimacy of Wren’s churches with the London around them. Hi Donna, thanks for the comment. I think it is the effect of the surrounding damage. Gerald Cobb’s picture is good. As well as writing a book on London churches, he also provided all the illustrations. Just to say how much I am enjoying your weekly pieces with their careful research and the insights they give into London past and present. Thanks for the feedback Ros. Much appreciated. And of course it’s now been beautifully restored and opened up as a delightful coffee shop within its splendid interior. I did not know there was a coffee shop at St. Nicholas. It was an afternoon hunting various photo locations and churches from a distance. I will look in next time. I was inspired again by this post to rewatch the Lavender Hill Mob. It really does bring the bombed area around Queen Victoria Street to life. Just after the heist, at 27:55 on my dvd copy, there is a clear ruined church tower. I couldn’t work out what or where… but eventually I’ve tracked it down as St Mildred’s, Bread Street. For a while I was wondering if it was St Clement’s East Cheap… but I’m sure it’s St Mildred’s. Another very interesting post, thank you. What is the other church tower visible in your father’s photograph, just to the right of St Paul’s? Is it St Augustine’s Watling Street – now the St Paul’s Cathedral Choir School?